H >Blog >Expert Blog >Mane ‘n Tail Hair Strengthener = Strong Hair! Why is Mane ‘n Tail Hair Strengthener the ‘it’ product for strong hair? According to Hailey Baldwin Bieber, “On most days, I pull [my hair] back and use Mane ’n Tail leave-in conditioner as my hairspray to nourish it and prevent breakage but still look styled,” she shared with Marie Claire.com. Hence, Mane ‘n Tail first and foremost, nourishes and protects, to keep strong hair! Thank you, Mrs. Bieber, you are exactly right! Why is Mane ‘n Tail Hair Strengthener a desert island product for strong hair? lightweight delivery system as a leave-in treatment spray! Liquid sprays unlike heavy cream base, hair isn’t weighed down. The combination of conditioners and proteins are carried by other ingredients that help them to penetrate the skin and plate the hair shafts with the benefits of Niacin (Vitamin B3 complex) and Panthenol (Vitamin B5) working synergistically to metabolize conditioners, vitamins and proteins along with other herbal ingredients into the skin and hair to maximize the effectiveness of the formula. 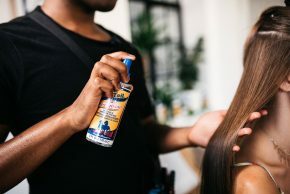 The goal and results…to moisturize, replenish, repair and even encourage hair growth, while preventing breakage, leaving the hair stronger and shinier. It protects against heat styling, and styling, chemical or environmental damage. 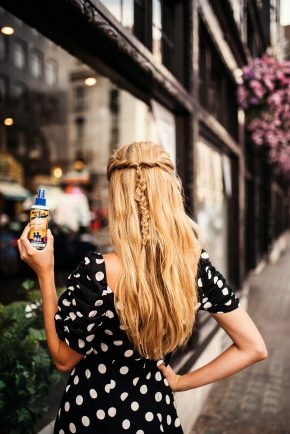 Mane ‘n Tail Hair Strengthener may be used on wet or dry hair as a light-weight leave-in conditioning treatment and then styled as usual. You may use it as an overnight treatment as well, it will facilitate a better wash out and styling the next day! Have a great hair day every day, the Mane ‘n Tail way! Discover the secret. Want your own ‘miracle’ hair strengthening product now?